A donor from 2017 who averaged 9 embryos over two flushes, H303 has solid pedigree out of the same cow as J228 who was the top price female in 2016. Her dam F905 sold in 2014 and was the 2nd top price female at that sale. 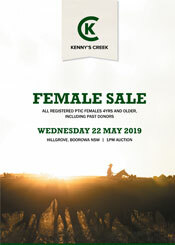 Sold pregnancy tested in calf to Kenny's Creek M4 with a male fetus.